with Padmini in the Tamil film, Vanjikottai Vaaliban, received much acclaim. and was one of the few graduates to enter the film world in those days. Mr.
in 1947) with the Gemini Studios added the title Gemini to his name. held his own with sensitive portrayals of the yearning lover.(courtesy:wikipedia). is Sivaji's nurse assistant. Sivaji offers to marry her after her father's death. to divert him from his research. Devi faces criticism from the womenfolk of the house for her intimacy with Sivaji. 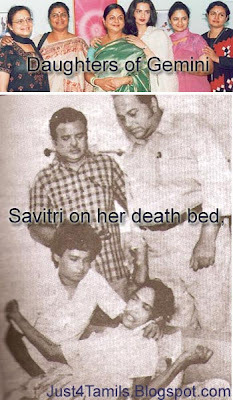 Sivaji's brother grows fond of Saroja Devi and tells Sivaji. Pasmalar (Also known in english as: The Flower of Love) is a 1961 film starring Savithri, Sivaji Ganesan and Gemini Ganesan. The film was cast in 1961 and directed by A. Bhimsingh.